Justin Schultz abandoned the Anaheim Ducks and he had every right to do so. Thanks to a loophole in the CBA, Schultz was able to become an unrestricted free agent before playing a game in the NHL. 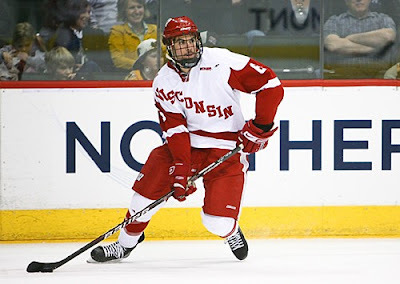 After completing his junior year at Wisconsin, he refused to sign with the Ducks and was courted by close to every team in the league, ultimately signing with Edmonton. The entire situation has rankled some people. How dare a kid who hasn't even stepped on the ice make NHL teams sell him on playing for them. Right. How dare he want to play in a city in which he's comfortable. How dare he try to put himself in the best situation to succeed. How dare he dictate his career, his livelihood, his future. Schultz was an unrestricted free agent and acted like every sought-after unrestricted free agent before him. He could have chosen to play anywhere in the league, so it wasn't his responsibility to sell himself. Sports is a business that treats players as cattle, bought and sold for the benefit of the team. Schultz merely took advantage of the system before the system could take advantage of him. Whatever you think of the loophole in the CBA, it's there. You may think what Schultz did was wrong, but it was his right to do so as defined by the CBA. It was as wrong as tacking on a bunch of bogus years to the end of a contract, years that no player intends on playing. It was as wrong as giving a player a no trade clause in a new contract and dealing him before it kicks in. The only reason this whole process turned into such a public ordeal is because Schultz is good. In 2010, Bill Sweatt left the Leafs to sign with his hometown Vancouver Canucks under the same loophole, yet nobody cared. Sweatt was a non-prospect. Last year both Blake Kessel and Jason Gregoire did the same thing. Nobody cared. For his part, Schultz has stayed quiet throughout the whole process. He isn't the hockey version of LeBron James, airing "The Decision" in some misguided attempt to further his brand. "The Decision" was a public slap in the face to the city of Cleveland; Schultz's decision has become a public slap in the face to Anaheim for reasons entirely out of his control. This whole process has gone public because media insiders like Darren Dreger and Bob MacKenzie have broken information to satiate our need to know everything immediately as it happens. When Blake Wheeler chose to follow a similar path to the NHL in 2008, spurning the Phoenix Coyotes in the process, it didn't cause the same reaction that has followed Schultz. That's because Twitter wasn't around and the same instant news cycle didn't exist. So despite how Schultz has handled the situation, it has spiraled into a circus. And although he had every right to do what he did, that does not in any way invalidate the anger Ducks fans are feeling as they see this whole situation play out in such a public manner. This is a team losing a blue chip prospect and that hurts. Now that the circus is over the only thing left is for Schultz to prove that he's worth the hype, something that will produce an entirely different circus altogether. Schultz was a junior. He chose to forgo his senior season and turn pro.